Universities spend billions to provide first-class research and education. To support that spending, these organizations rely on student’s tuition fees, and funding they receive from government/corporates. In essence, revenue generation of universities depends on external factors. Hence, it’s the high time all the universities start exploring new ways to generate revenue from their resources which could make them self-sufficient. What are the Resources which Universities can use to generate Revenue? 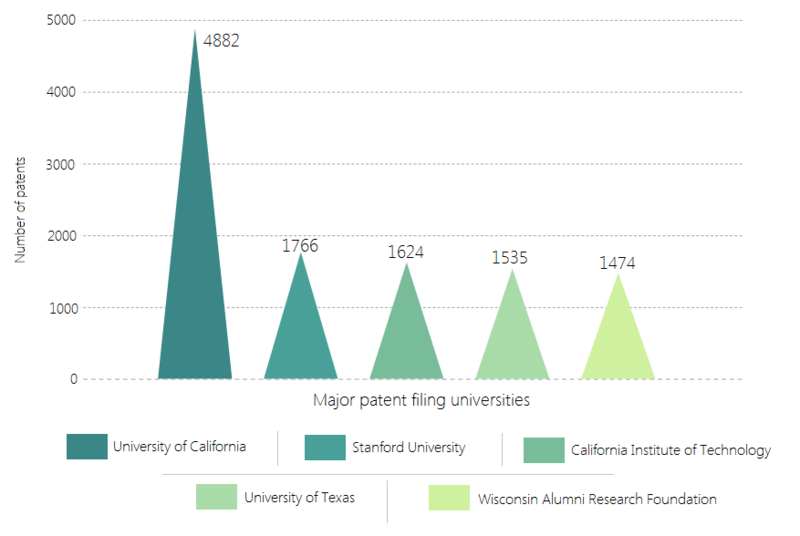 The graph below represents some prominent universities that are filing patents with the USPTO to protect their research and inventions. Other than these five, there are many other universities having 1000+ patents in their portfolio, which indicate that there is a lot of research going on. Given that universities indulge in quality research – at least comparatively – their patents must generate revenue for them, which is not the case currently. This means patent portfolios of many universities are an underutilized asset (stats below) eating dust sitting in a corner. This is because either the universities are not monetizing their patents or they are not monetizing their patents the right way. 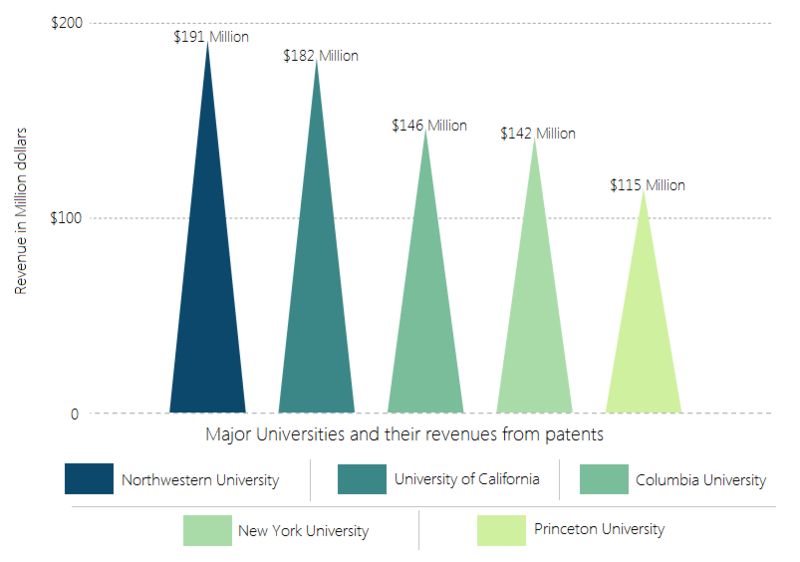 Which Universities are already Monetizing their Patents? There are few universities that have strong IP departments and are earning by selling/licensing their patents. The University of California with 4882 patents earns ~$182 million from patent licensing. The graph below provides licensing revenues of five other universities. Now, what we like is that some universities are also using legal means to enforce their patent rights. The figure below gives you a glimpse of some popular infringement lawsuits filed by universities against big companies. Side Note: If you want to know how to figure products infringing your patents, here is a method to find ’em: How to find product infringing your patents? In 2011, the top 100 universities generated $1.8 billion from patent licensing which in 2013, witnessed an 8% increase. In 2012, Carnegie Mellon University won a whopping $1.17 billion from Marvell Semiconductors from an infringement case that it filed in 2009. Later in February 2016, CMU and Marvel Technology settled the case in which the latter promised to pay $750 million. This, however, is not the story of every university. There are universities that are struggling to monetize their patent assets. According to a study by AUTM, for many universities, the gap between licensing and R&D expenditure is very wide. What Are Other Universities currently doing wrong? To bridge the gap between invention and commercialization, some universities are knocking doors of companies such as Intellectual Ventures (IV) which has earned the infamous moniker of a patent troll. More than 60 institutions have sold their IP assets to IV. These companies grab a bigger piece of the pie which decreases the market value of a patent for its assignee. A recent Brookings Institution study revealed that patent licensing campaigns don’t actually bring much revenue to universities. Having said that, instead of hitching their wagon to patent trolls, universities should focus on true technology transfer. Universities, in general, do not provide relevant evidence of support for their assets. The University of South Florida, for example, wanted to license its patent US8138907 . To attract potential buyers/licensees, it provided a document which only illustrated the technology disclosed and its benefits. It did not provide any information/evidence illustrating available products in the market using their patented technology. As a result, it is bound to attract fewer companies to buy/license as corporations, in general, don’t buy a patent without any visible market. Thereby decreasing the overall value of the patent. Universities need to have a well thought out plan for successful patent monetization. They can even utilize automated tools for that matter. Here is a list of tools that can help in building a monetization strategy: Automated tools that help in patent monetization. Even in the current tough patent marketplace, a portfolio with strong evidence of use charts commands good money. 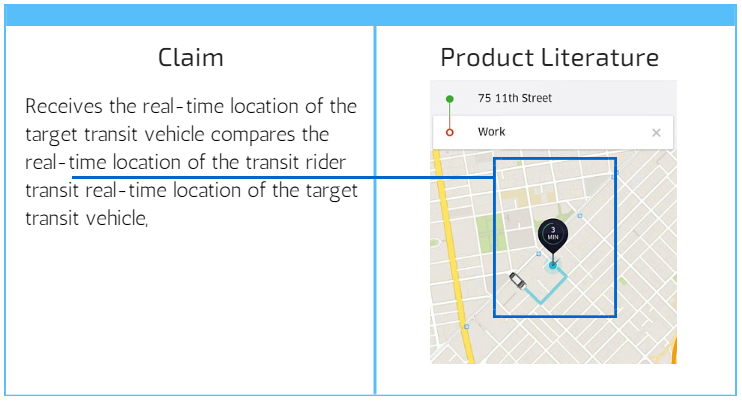 Evidence of use charts are documents which provide evidence that your patented technology has been used by other companies. This document helps prospective buyer of your patent get a fair idea about the worth of your patent. When an on offer patent portfolio involves a large number of patents, it’s not advisable to prepare evidence of use charts for all patents in the portfolio — since this will involve a lot of time and money. Instead, the smart approach will be to identify various technology clusters in your patent portfolio and then locate key patents in each cluster. One can then proceed with preparing the evidence of use documents for these key patents. These documents can be shown to potential buyers/licensees or used in the court to monetize the asset. Reverse Engineering to stripping/using the product to identify the required features related to product functioning. Claim Amendment Suggestions for broadening the scope of the patent by filing for continuations with amended claims. Is there an example to justify the same? In order to help you drive the point home, we performed a sample analysis. We picked patent US8138907 filed by the University of South Florida that discloses a travel assistant device. 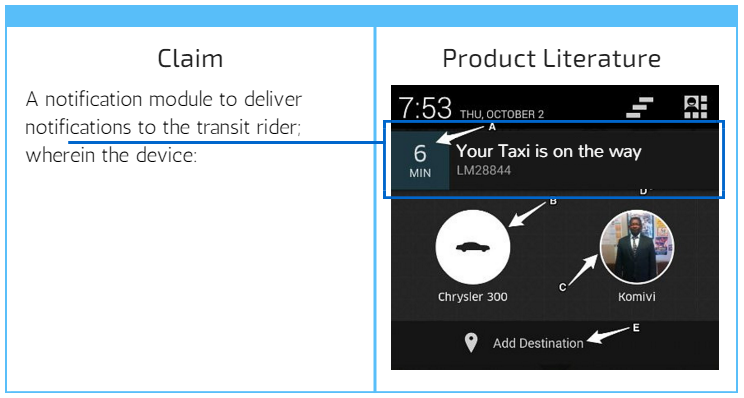 On performing analysis, we found that the patent would overlap on most of the taxi services. The University of South Florida using the sort of analysis above can monetize their patents or can enforce it on relevant companies. 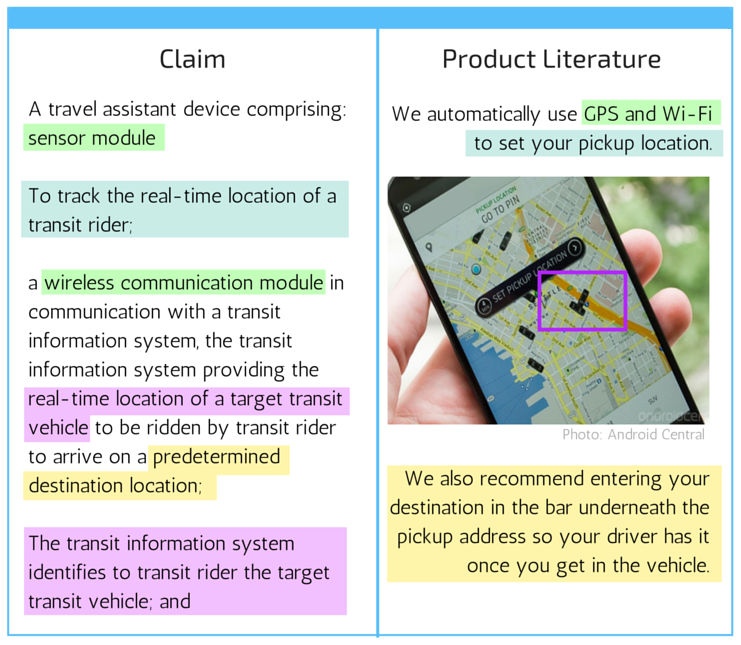 Other than that, the University can license/sell the patents to other companies – Mercedes, Lyft, BlaBla Cars – that want to have such patents for their business. Similarly, universities can identify star patents from their portfolio and prepare proofs for infringing products. A well-crafted patent monetization strategy will always help a university get good value for their patent. But how universities can file star patents, is a question. Isn’t it? Well, there doesn’t exist a problem without a solution. Here is a solution to this conundrum: how to file high ROI generating star patents? P.S. Do you know which top 5 universities are leading the research in Wireless Communication? You can find the information here: Top 5 universities of wireless communication research.